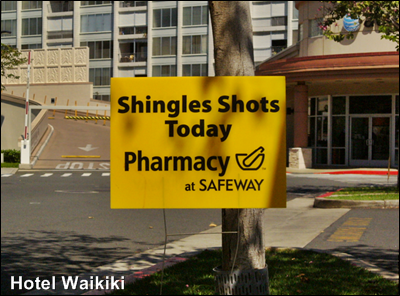 HOTEL WAIKIKI: Shingles? I'll Have to Look it Up. If it's the skin thing, it's awful. A friend of mine has it. Terrible, terrible! I already got my shot. They wouldn't give it to me until I turned 60. My mother had shingles and it was AWFUL! Ann- that's not a new clinic. It's Safeway. Read my post. Wait, wait, I still have to write the post. The text part. Nate- I think I remember something about it, but it may have been something else altogether. Kay- this don't sound good at all. The name, itself, is creepy. 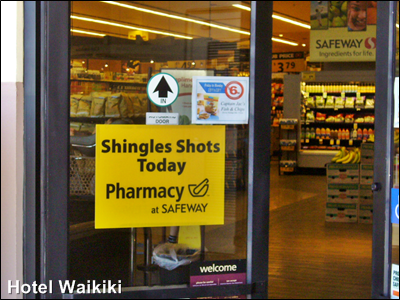 Shingles is flare of up the chicken pox virus in an adult. It is extremely painful, and typically flares up along nerve lines. I am prone to outbreaks. So, the shot is helpful.